The Free Officers (Egyptian Arabic: حركة الضباط الأحرار‎ Ḥarakat aḍ-Ḍubbāṭ al-ʾAḥrār) were a group of Egyptian nationalist officers in the armed forces of Egypt and Sudan that instigated the Egyptian Revolution of 1952. Originally established in 1945 as a cell within the Muslim Brotherhood under Abdel Moneim Abdel Raouf, which included Gamal Abdel Nasser, Hussein Hamouda, Khaled Mohieddin, Kamal el-Din Hussein, Salah Naṣr, Abdel Hakim Amer, and Sa’ad Tawfiq, it operated as a clandestine movement of junior officers during the 1948 Arab–Israeli War. Muhammad Naguib joined the Free Officers in 1949, after the war, and became their official leader during the turmoil leading up the republican revolution because of the hero status he had earned during the war, and his influence in the army. 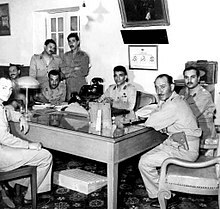 The Free Officers Committee enlisted General Muhammad Naguib as a public figurehead in preparation for the successful coup of 23 July 1952. The men who had constituted themselves as the Committee of the Free Officers Movement and led the 1952 Revolution were Lieutenant Colonel Gamal Abdel Nasser (1917–70), Major Abdel Hakim Amer (1919–67), Lieutenant Colonel Anwar El-Sadat (1918–81), Major Salah Salem (1920–62), Major Kamal el-Din Hussein (1921–99), Wing Commander Gamal Salem (1918–2001), Squadron Leader Hassan Ibrahim (1917–90), Major Khalid Mohieddin (1922–2018), and Wing Commander Abdel Latif Boghdadi (1917–99); Major Hussein el-Shafei (1918–2005) and Lieutenant Colonel Zakaria Mohieddin (1918–2012) joined the committee later. ^ a b c d Gelvin, James L. The Modern Middle East: A History. New York: Oxford University Press, 2008. ^ All the revolution's men. Al-Ahram Weekly. Issue No. 595, 18–24 July 2002. Accessed 20 August 2012.